The second-to-last time I discovered problems with the SMUFs (small mammals underfoot), I replaced my new soaker hose with fresh hose. That was so exhausting it wasn't until the following week that with the weather's help (two drops hit me) I was able to use the tractor to deposit dirt to bury said drip hose away from SMUFs. When I returned from a week's effort of making money from the Rechtel partnership where I'm employed, that is ripping off the tax payers, I found a dead plant, and many holes in the buried tubing. For the non-technical readers, one week is 7 days x 24 hours x 60 minutes x 60 seconds equals 604,800 seconds. I only observed 580,028 bites in the tubing, so either the SMUFs weren't fully engaged in their task, or maybe a Red-Tail or bobcat made an appearance.The next obvious step is to connect a PLC to an IR sensor and then to some miniature Claymores. That can't happen until I get the water tanks in operation to limit the damage from the ensuing conflagration. Small bamboo whip traps might also be employed. Now if the gentle readers are aghast, I'm a kind and benevolent soul and have no quibble with what the critters (this doesn't include pigs) do with the remaining 99.8% of our land. The last two weeks have provided some interesting moments in terms of wildlife encounters. The Sunday before last, for fun and exercise, I hauled myself up to the top of a pretty good hill, and as I'm resting, catching my breath and starting to get out my water jug, I heard loud rustling in the underbrush about 75 feet in front of me. Cool, I think, deer, maybe I'll see them as they bound away. No bounding, more and louder rustling, from at least two places. Oh, it's cows. See a glimpse of medium-sized (not large cow-sized) critter, darkish. Starting to question why I'm there now, and then hear the grunting and squealing. "Oh goodness gracious, my heavens", I think, "wild pigs!" (Sure, believe that language.) Fear winning out, I slowly and deliberately started walking right on back down that hill, keeping an ear out and glancing behind me to make sure they weren't deciding that I was getting on their nerves. Saturday last, I got to feeling antsy and took off on a walk. I headed back up the same hill where I saw the wild pigs last week, thinking surely they would have moved on. They weren't at the top of that hill, and since I was a little bored with my route, instead of going straight back down the hill, I thought I could do a little cross country to the next hill over and walk up that one. Meanwhile, I knew of a good spring on the way where I might see some good birds so I headed for that. As I made my approach, and got up to about 50 feet away from the spring, I'll be darned if I didn't hear that same scary squealing that I did the week before. This time I saw the pig plain as day - it didn't like me much and took off downhill through the creek bed. I waited for my heart to stop pounding and caught my breath and pondered whether I wanted to continue with my plan or again make a retreat. I have to say that I had a feeling that there wasn't just the solitary pig, but I wasn't hearing or seeing any more. So I called out, "Hey is it safe to go down there? Are there any more pigs?" Instant boilup of pigs - maybe 8 or 9, all coming up out of the spring area. One of them started running in the wrong direction, i.e. toward me, so I waved it off - shoo shoo pig! What else could I do? Anyway, that tactic worked and they all went one way and I went the other. I always thought that wild pigs were wily and wary and it was hard to get close to them. It isn't as if my approach is subtle - I just tromp along in my boots, rustling dry leaves and snapping branches, surely you would think they could hear me. I'm sure if I had had ill intent, they would be a million miles away. And yeeps, two weeks in a row! I did continue my walk which only had one more eventful moment when I woke up a snoozy bobcat who had been taking a siesta under an oak tree. 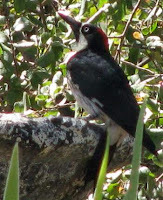 When I got back from that excitement I had my lunch and watched several minutes of hijinks a la acorn woodpecker on the bird bath. There were three or four of them tussling and I grabbed the camera and got this shot. 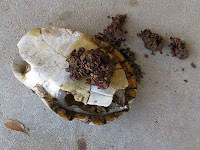 More wildlife doings: some weeks ago, the Dinosaur found an empty Western Pond Turtle shell and brought it back to the house as a point of interest. Evidently, he put some saddle soap on it in the hopes of preserving the turtle leather. Lo and behold, waiting for us this weekend: evidence of coyote tampering. Guess they don't like soap. One could say that the predominant smell of California range land this time of year is that of tar weed, notwithstanding the fact that this year it seems to be wildfire smoke instead. Nevertheless, during the summers here at Dryad Ranch we know we are home when we are greeted with the aromatic scent of the native yellow tar weed, Holocarpha virgata ssp. 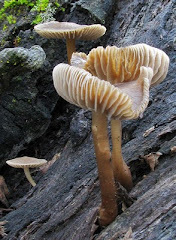 elongata. 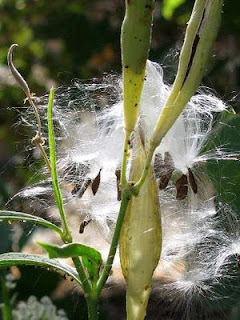 The variety with which we are blessed can get more than 2 feet tall and as its name suggests, is quite sticky and tarry. It sports small prickly burrs that attach to pants legs and that combine with the resin to make a mess of horses’ faces as they graze. It is starting to bloom now, with small yellow blossoms appearing at the end of the stalk. It is very well adapted to the very dry conditions and seems to be one of the few plants that bloom this time of the year. In the photo below, pretty much everything in the meadow that has even the slightest appearance of green-ness (other than the tree leaves) is tar weed. 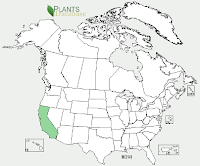 And in case you were feeling left out and were really hoping your state could get some tar weed, according to this range map retrieved from the USDA web site, you ain't gonna be so lucky!